Out of the over 300 teams that play college basketball, perhaps no team is playing as well as the Kansas Jayhawks. Bill Self's team has not lost since all the way back on January 25th, and have rolled to their 12th straight Big 12 regular season title, the Big 12 Conference Championship, and of course, the top seed in the South Region. The Jayhawks have one of the most experienced teams in the nation, headed by a group of motivated veterans. Forwards Perry Ellis and Wayne Selden, along with guards Frank Mason and Devonte' Graham have won a lot of games in their Kansas career, but have yet to really have a grand moment in March. 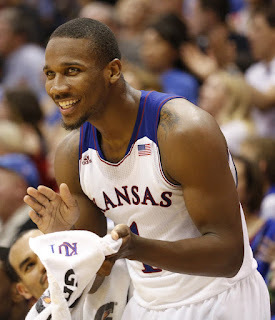 Ellis and Selden may very qualify as the team's X-factors for their tourney run. Ellis is about as fundamentally sound as you'll see in college basketball, and Selden has moments where he is unstoppable, on both sides of the ball. However, the pair also has moments where they are invisible, which obviously hurts the Jayhawks. Forward Carlton Bragg seems to be improving each and every single game, and youthful forwards Svi Mykhailiuk and Chieck Diallo are also taking steps. That gives Self plenty of options to work with and also raises questions that this Kansas team may be just scratching the surface of what they could be. Not only did the NCAA Selection Committee give Kansas the top overall seed (which they are deserving of), they also gave them, in my opinion, the easiest region to make a deep run. Yes, Maryland, Cal and Arizona are dangerous teams and peril exists throughout the region, but there isn't a worse No. 2/No. 3 seeds than Villanova and Miami. Neither have done anything noteworthy in March for a long time, and the Jayhawks match up very well against them. Kansas won't have an easy path to the Final Four, nobody ever does, but if they can play smart basketball they should be able to overcome some of the dark horses in the region and get Self back to the Final Four, after a few years of fruitless NCAA Tournament performances. Stop me if this sounds familiar: a UConn team underachieving throughout the regular season, and then suddenly finding their rhythm come March, winning the conference tournament, and appearing very dangerous behind a number of veterans and great guard play. Though, this UConn team is not the same type of teams that made runs behind the play of Kemba Walker and Shabazz Napier. They are too thin in their frontcourt to be thinking of a deep run, and they don't have an absolute superstar. But, this Huskies team could still do plenty of damage. Daniel Hamilton emerged as one of the American's best players down the stretch and he took over at times for the Huskies. The wing doesn't have a crisp jumper, but he is a crazy athlete and finds ways to finish. Joining Hamilton will be forward Shonn Miller, another terrific athlete, and former NC State wing Rodney Purvis, who is terribly inconsistent, but has so much talent. Paired with Amida Brimah down low, this Huskies team has legitimate potential to cause some damage this March. Colorado is no breeze in the first round, and Kansas beyond that would obviously be a large challenge. Yet, with Kevin Ollie on the sidelines, you can't ever overlook the Huskies. Ollie is one of the best in late game situations, and always gets his players to perform on the biggest stages. From a strictly talent outlook, California is one of the best teams in the nation. Former five-star recruits Jaylen Brown and Ivan Rabb are studs, and Tyrone Wallace, Jabari Bird, and Jordan Matthews are veterans with a proven pedigree. Yet, basketball games aren't won on talent alone. The Golden Bears had moments where they struggled mightily this season, and they are still extremely youthful. Yet, Cuonzo Martin's club won nine of their last 11 games, and you get a feeling this is team could be dangerous, if they can survive a scary first-round game against Hawaii. The Bears aren't a great halfcourt team; they don't have much to support them in the paint, and they are inconsistent from deep, which hurts their spacing. But, in the open court, they have amazing flow, great vision and fantastic finishing ability. They can't win games solely in transition, but it will be a major supporter to their offensive game throughout the NCAA Tournament. What would help even more is if Ivan Rabb took over. Rabb has put up solid numbers across the board this year and appears to be a likely lottery pick in the 2016 NBA Draft this summer. Though, he has never been especially dominant, and it has hurt Cal, who could really use a piece to punish opponents in the low post. Even if their amazing talent doesn't completely come together perfectly, this Cal team should still win a couple of games. Perhaps, they might even be prepared for an upset down the stretch against Kansas. I'm not going to sugarcoat it at all: Vanderbilt has no business being in the NCAA Tournament. Yes, center Damian Jones is a star, and guard Wade Baldwin is extremely underrated, but the Commodores are 2-7 against the RPI Top 50, and didn't do anything notable in the SEC Tournament. That is a good thing for their First Four opponent, the sneaky Wichita State Shockers. Wichita State fell off the national scene early on in the year when they lost a number of non-conference games, when star guard Fred VanVleet was out with injuries. Though, the Shockers would find their mojo once VanVleet got healthy, only to suddenly go back on the bubble following a loss to Northern Iowa in the Missouri Valley Conference Tournament. The Shockers deservedly got into the field, and could be ready for a deep March run, reminiscent of their run in the 2013 NCAA Tournament. Ron Baker and VanVleet are two of the nation's most underrated players, only because they play in little Wichita, Kansas. Baker is one of the country's best shooters, and a physical defender that should be set to lock down a number of studs. VanVleet won't fill a box score all the time, but he is a great passer, and runs the Shockers' offense to perfection. The Shockers also possess forward Anton Grady, a beast on the block, and Kansas transfer Conner Frankamp, both who could play a major role in the Tournament. Experienced teams that play great defense and have veteran leaders are always threats to go deep in March, and Wichita just so happens has that. Arizona isn't an extremely tough matchup and Miami wouldn't be after that. While Wichita State isn't the trendy dark horse they once were (only know because we expect them to do damage), it doesn't mean anyone should sleep on them. Per typical Fran McCaffrey-at-Iowa standards, the Hawkeyes rolled through the first three months of the season like a Top 10 team. Jarrod Uthoff, Mike Gessell and a veteran lineup swept Michigan State, would compile five total Top 25 wins, and were perched on top of the Big Ten standings for awhile. But, like typical Fran McCaffrey-at-Iowa standards, the Hawkeyes completely fell apart come February and early March. Their offense lost any bite, they couldn't defend and they didn't know how to do anything late in close games. An upset loss to Indiana on February 12th ushered in an era where the Hawkeyes six of their last eight games, including a loss to lowly Illinois in the Big Ten tournament. That left Iowa, who once stood as the nation's No. 4 team, to a seven seed. Though, the Hawkeyes could still have a little fight left in them. Uthoff is about as good as they come, the former Wisconsin transfer is a good shooter, good penetrator and uses his freakishly long arms to make plays on the defensive side of the ball. Gessell is a great point guard, Anthony Clemmons and Adam Woodbury are solid, and Peter Jok has moments where he is the best player on the court. Now, the Hawkeyes just have to figure out how to put it all together and close out games, and luckily for them they don't have a very tough draw. Temple is a decent team but they also have major deficiencies and a win against them likely draw Villanova, and their recent March struggles have been well documented. Few teams enter this year's NCAA Tournament as cold and out-of-sync as Iowa does. Yet, I'm picking them to head to the Sweet 16, and they should not be overlooked as the Tournament goes forward. 1 Kansas over 16 Austin Peay... The Austin Peay Governors have already had a pretty magical March, as the eight seed in the Ohio Valley, they won the conference. That magic won't survive against Kansas, plain and simple. 9 UConn over 8 Colorado... If the Huskies can contain massive Josh Scott and the great-rebounding Buffaloes, they should be able to ride Daniel Hamilton to a win. 5 Maryland over 12 South Dakota State... The Terps have underachieved this year, but the Jackrabbits will have no match for Robert Carter and Diamond Stone underneath. 4 California over 13 Hawaii... Stopping Stefan Jankovic (a Missouri transfer), will be no easy task for California, but Jaylen Brown and Ivan Rabb will more than make up for it on the offensive side of the ball. 11 Wichita State over 6 Arizona... The Wildcats are very talented, but haven't exactly been able to dominate offensively this year. Can they really outscore Wichita, perhaps the nation's best defensive team? 3 Miami over 14 Buffalo... First-year head coach Nate Oats has done great work with Buffalo, but they will have no match for Miami's athletic wings. 7 Iowa over 10 Temple... I still believe that a team led by Uthoff, Jok and Gessell can go deep in the tourney, and the Owls aren't exactly a great team. 2 Villanova over 15 UNC Asheville... The lethal three-point shooting of Villanova guards Ryan Arcidiacono and Josh Hart will be too much for UNC Asheville to overcome. 1 Kansas over 9 UConn... The Huskies just don't have the depth to compete with Kansas for 40 minutes, particularly if the Jayhawks get big contributions from Wayne Selden and Devonte' Graham. 5 Maryland over 4 California... Expect Maryland to do the exact same thing they did against SDSU; pound the ball against a Cal team without a true, dominant big man. 3 Miami over 11 Wichita State... The stingy Shockers will put up a fight, but even they can't stop the playmaking of guards Angel Rodriguez and Sheldon McClellan. 7 Iowa over 2 Villanova... Adam Woodbury and Uthoff should neutralize Daniel Ochefu down low, making the Wildcats extremely one-dimensional and vulnerable. 1 Kansas over 5 Maryland... So many future NBA studs in this game, and the talent on display is impressive. But, Maryland just doesn't have the experience, nor a coach that knows how to consistently win in the craziness of March. 3 Miami over 7 Iowa... The Hurricanes dictate tempo so well and they should be able to speed up Iowa. That should set the stage for plenty of mistakes and turnovers, and a Miami trip to the Elite Eight. 1 Kansas over 3 Miami... I love Jim Larranaga and I think Miami has been greatly overlooked this season. But, the 'Canes aren't deep enough or good enough defensively to overcome the Jayhawks on a neutral court.